The Scholastic Book Fair was held in the library October 15-19. The two most popular books were Grenade by Alan Gratz and The Collector by K.R. Alexander. 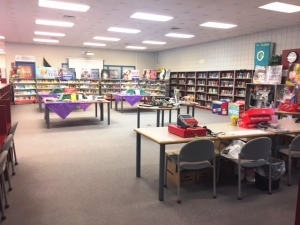 I’d like to thank staff members who volunteered a little bit of their time to help out in the book fair: Ms. Loies, Mrs. Doherty, Mrs. Vroom, Ms. Herald and Mrs. Hupp. I’d also like to thank my wonderful parent volunteers: Jen Falli, Melissa Szatkowski and Melissa Rippe. With total sales more than $7,500, it takes a village to run a successful book fair! 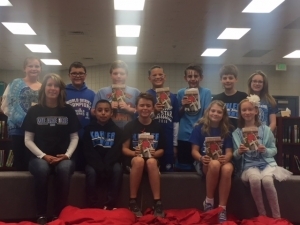 There were twelve students who participated in the Kahler Book Club. We read When You Reach Me by Rebecca Stead. 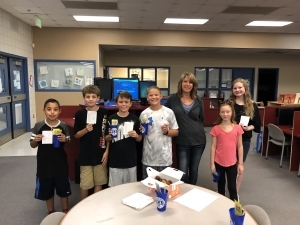 I always like to do something fun with my book club kids when we have finished reading our book. We played the game of Hedbanz with teachers who were chosen by the students. Thank you Ms. Gravely, Mrs. Wydrinski, Ms. Huesca, Ms. Traficante, Mrs. Bruni, Mrs. Barajas, Ms. Olson and Mrs. Kvietkauskas for playing! It was so much fun! 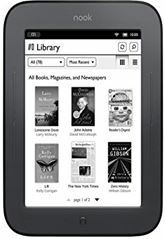 Our NOOK eReaders are ready to be checked out! Stop by the library for a permission slip and to see a list of available titles.